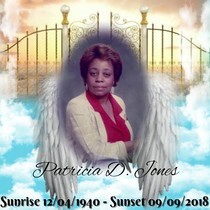 Obituary for Patricia D. Walton Jones | Minor-Morris Funeral Home, Ltd.
Patricia D. Jones affectionally called Pat, Auntie Pat and Pat Pat was born December 4, 1940 to her parents, Edward B. and Bernice Walton both of who preceded her in death. She was the third child of six children, Edward, Fessor Ike (Deceased), Barbara, Charles (deceased) and Lynda (deceased). Pat was a product of Chicago Public School System she attended Oakland Elementary grammar school from kindergarten until eighth grade, she then attended & graduated from Dunbar Vocational High School. Pat accepted Christ at an early age. She was a member of Bryn Mawr Community Church and an honorary member of Light House Baptist Church where she was loved. Pat’s career was spent at one company. The company changed hands three times, Illinois Bell, Ameritech and now AT&T but Pat the dedicated employee stayed until she retired. Pat received recognition for being a 30-year employee. Although she had no children of her own, she made sure all her nieces and nephews were good, they were her children, and she celebrated every occasion that she could. Pat was the family historian she knew all the family members near and far. Pat was small in stature, but her giving heart made her a giant. Pat was an avid, excellent bowler where she, Barbara and Charlie were in a league for many years, she continued to bowl until her illness made it hard for her. Pat was an artist as well, she taught art and had a couple of pieces in an art show. In the late 80’s Pat was diagnosed & beat breast cancer, well that ugly demon tried to return in 2014 and Pat being who she was feisty & stubborn beat it again, during that time of her illness, it was discovered that she had kidney disease and had to immediately be put on dialysis. That did not damper her spirit she was still Pat!! She was a fighter, she was courageous, and she was determined. In her later years, Pat just wanted to be happy, to have fun and she loved the casino. Saturday night, courtesy of her great nephew Lil Mike, Pat had a great time at the Casino, Barbara said that’s all Pat talked about until they went to bed was how good of a time she had. Sunday morning between 8 and 9 am Pat went peacefully in her sleep. Well done God’s Faithful Servant. To be absent from the body is to be present with the Lord. Pat leaves to cherish her memory her companion and sister Barbara Davis; thirteen nieces and nephews Eddy, Celeste, Tracy, Michael Sr., Tonja, Cynthia, Karita, Janese, Robin, Andre Sr., Charles Jr., Edward and Chris; thirty (30) great-nieces and nephews, twelve (12) great-great nieces and nephews, a host of cousin, relatives and friends.